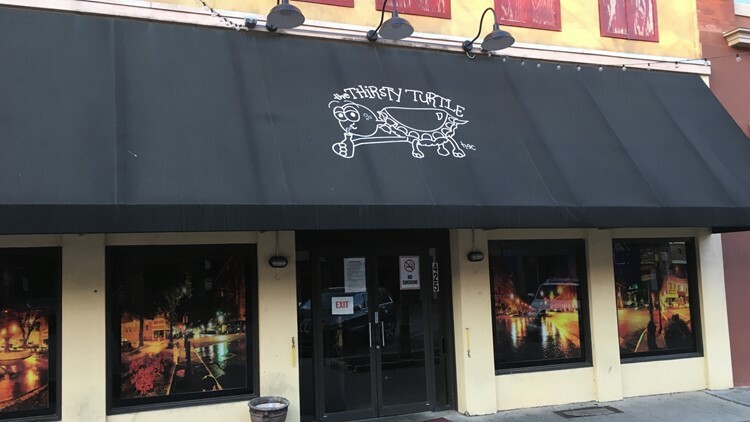 The Bibb County Sheriff's Office says it happened at the Thirsty Turtle on Cherry Street just before 2 a.m.
MACON, Ga. — Bibb deputies are investigating after shots were fired at a club in downtown Macon early Sunday morning. Sergeant Clay Williams with the Bibb County Sheriff's Office says it happened just before 2 a.m. at the Thirsty Turtle on Cherry Street. Williams says 27-year-old Rogers Kyaruzi, of Lithonia, is facing multiple charges, and a warrant for reckless conduct was issued for him. He says Rogers approached an unknown female, but she didn’t want anything to do with him. That's when another man approached Rogers, pretending to be the woman’s husband. Rogers and the other man then got in a fight and multiple people started striking Rogers. When security moved in to break up the fight, an unknown female struck Rogers in the head with a bottle, which caused him to pull out his gun and fire a shot into the ceiling. Williams says no one was seriously injured. A couple people were cut with glass, but no one was shot. Rogers was taken to the Medical Center, Navicent Health to be treated for his injuries. The sheriff's office is also seeking charges against other people involved in the fight. It's a ongoing investigation, and anyone with information can call the office at 478-751-7500 or Macon Regional Crimstopper at 1-877-68CRIME.